We’re excited to announce that, thanks to the work of teacher Sheila Jordan, RRHS has been awarded the distinction of Global Navigator School by the Council for International Education Exchange (CIEE). The Global Navigator Scholarship program offers scholarship programs for students to participate in summer study abroad. 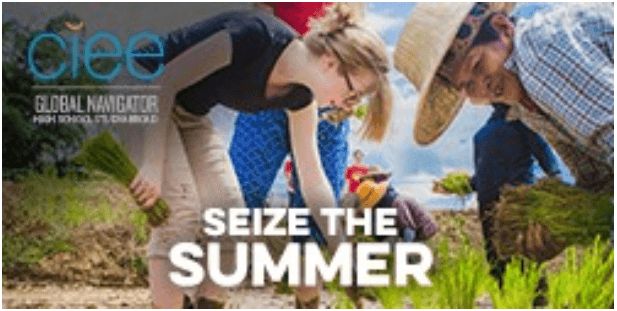 These summer programs are offered by CIEE, a leader in international education. They feature top-notch academics and cultural immersion, combined with exciting activities that bring learning to life. Language & Culture – Spanish, French, Mandarin Chinese, German, Japanese, Italian, or Arabic, instruction tailored to their level of proficiency, interactive language classes, and immersive experiences with a host family and native-speaking peers to rapidly develop their language skills. Service & Leadership – . Students may select service programs dealing with topics such as community development, children’s rights, education and more. Global Discovery – Programs focus on such fields as Digital Filmmaking & Documentary, Global Entrepreneurship, Arts, Environmental Science, or Marine Science. Any student graduating in 2020, 2021, or 2022 is eligible to apply for a scholarship. Funds will be awarded based on merit and on financial need. The deadline to apply for a Global Navigator Scholarship is November 30, 2018. Up to 75% of available funds will be awarded at that time, giving applicants their best chances at a scholarship for their first choice destination. Final application deadline is February 18, 2019. The Regional Coordinator will be on campus all day October 23rd in the 100 Lecture Hall to give mini presentations, help students fill out applications, and discuss scholarship opportunities during all lunches. She will host an evening session October 23rd from 6:30-8:00 pm for parents/guardians/students in the 100 Lecture Hall. For additional information, please click the photo below to visit the CIEE website.